15 km from the town of Narbonne, between the Mediterranean Sea and the mountains of the Regional Nature Park of the « Massif de la Clape », is Narbonne-Plage with its magnificent beach of 5 kms of fine sand. The sand is cleaned daily in the season (June to September). The beach slopes gently into the sea and is supervised during the season which is important for small children. Furthermore there are no sea urchins to fear in the clear water. 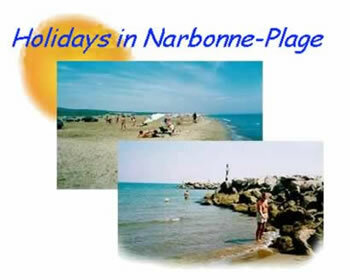 At Narbonne-Plage, far from the busy resorts or industrial pollution, you can spend a marvellous holiday with the family in a calm and agreeable environnement. It is the ideal setting for relaxing the body and the soul. Dogs and their owners can bathe in the non-supervised section of the beach reserved for them. The photos above were taken there, for we too have a dog and that’s why, for us, real holidays are holidays with the dog ! The gentle Mediterranean climate attracts retired people for long stays during the winter months. The shops and restaurants are open all year. And there are three good doctors nearby if needed. Visit the following pages of holiday villas and apartment, we rent from the owners, you save the costs of agency !